In 1851, the “Victoria Cameo” is gifted by Queen Victoria to Letitia Newton, who though considered an old maid, soon has the attention of three gentlemen. 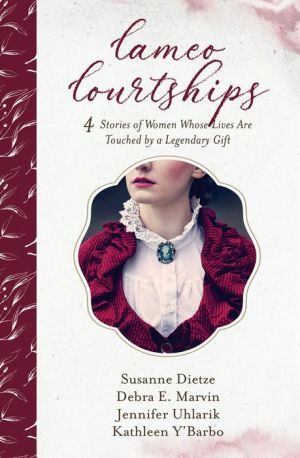 Inspired by her own romance and quick marriage, Letitia decides to gift the cameo to other women in her family, hoping romance will follow. After receiving the Victoria Cameo, aspiring journalist Clara Newton works to expose a smuggler, but reporter Byron Breaux must break the story first or lose his job. Working together is out of the question until they learn secrets that threaten Clara’s father. . .and her heart. Trouser-wearing frontierswoman Petra Jayne Hollingsworth has no intention of donning the heirloom cameo, but she might be willing to wager it in poker game to save a young friend. Reverend Dustin Owens happens into town just as the game winner demands both women work in his brothel. He may save the women’s virtue, but can he help Petra regain her cameo and rediscover her faith? It takes a Pinkerton to find a Pinkerton, and Ethan Butler has been charged with finding Lizzie Carnahan. Just when he locates her, the cameo he is to deliver is stolen. It appears his previous case has discovered his presence in New Orleans, but he can’t return to that case until the cameo is found. With Miss Carnahan as a reluctant partner in crime fighting, can Ethan Butler locate the cameo and its thieves without losing his heart? When the arrival of a handsome Scottish administrator ruins Miss Bertie Hart’s dream to work in the children’s department of the new Carnegie Library, even she eventually stops fighting the fact that, despite Mr. Russell Smart’s secretive past, his determination and his love of words just might make him the perfect partner. She might finally have to wear the family cameo she’s heard inspires romance.